A workplace wellness program promotes the health of their employees through several types of health promotion strategies for various wellness topics. Awareness Raising Activities raise awareness about important health issues by choosing effective communication strategies that reach all of your employees, such as sharing health information through posting posters, pamphlets or newsletters on bulletin boards, e-mail blasts, social media posts, information on paystubs or through posting on an internal workplace website. Education and Skill Building Activities help employees develop the knowledge and skills necessary to support healthy living. Such as through lunch and learn presentations, demonstrations, webinars, health fairs, workplace challenges, and workplace contests. Workplace Environmental Supports create a physical, social, and cultural workplace environment that encourage and support employees in making healthier choices. Supportive environments help make the healthier choice the easier choice in the workplace and beyond. Supportive Workplace Wellness Policies can go a long way to ensuring that awareness raising, education and skill building, and environmental support components are in place now and into the future. 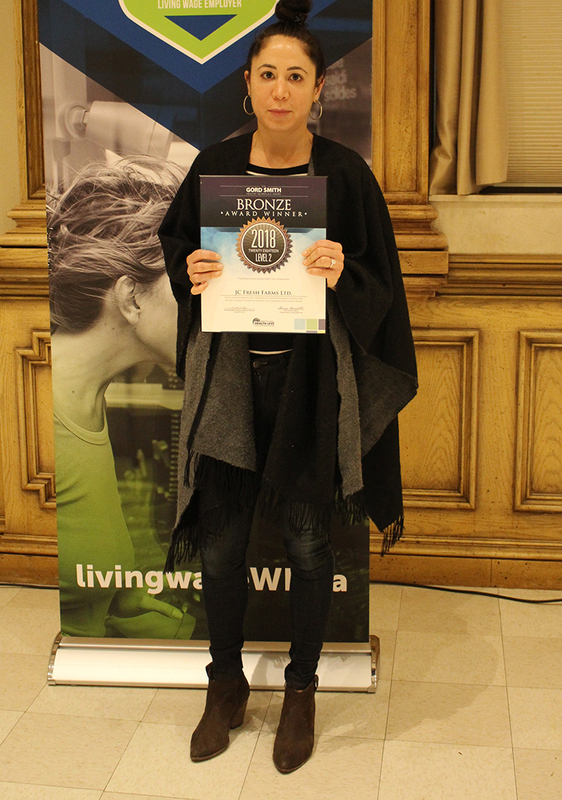 How can local workplaces be recognized for their commitment to workplace wellness? The Windsor-Essex County Health Unit and the Working Toward Wellness (WTW) Workplace Wellness Committee recognize local workplaces that provide comprehensive workplace wellness programming and support employees using their bicycles as a form of active transportation through the annual Gord Smith Healthy Workplace Awards & Bike Friendly Workplace Awards Program. 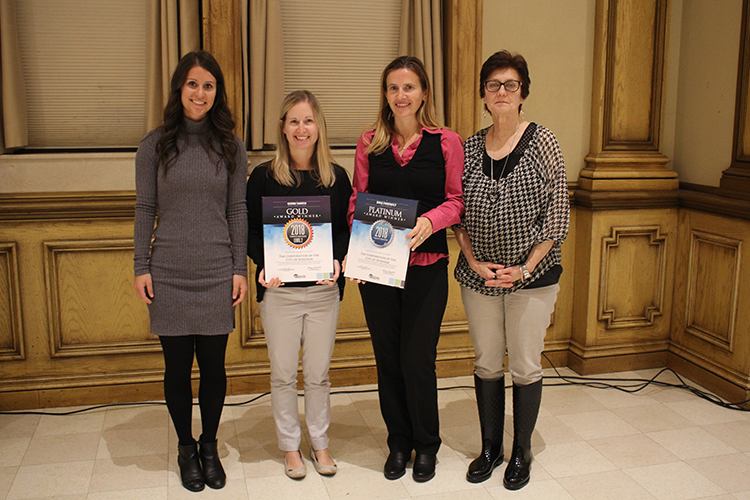 The awards program is available to all workplaces in Windsor and Essex County, regardless of the company size or how established the workplace wellness program may be. 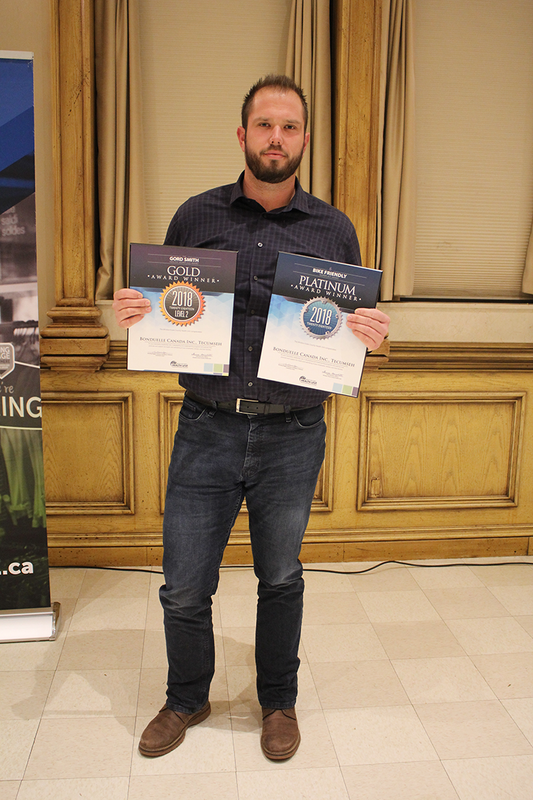 Workplaces receive an awards plaque that can be displayed at their workplace, a custom e-signature for their e-mails, and community recognition at the annual awards ceremony. 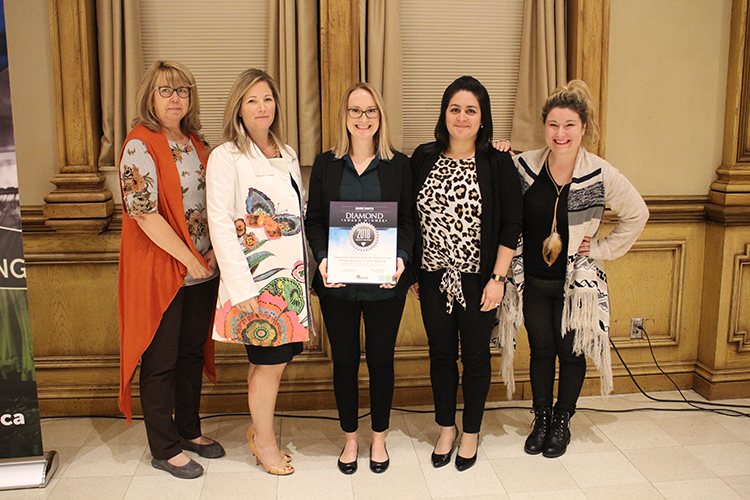 February - The 2019 Workplace Wellness Toolkit with the details on how to complete the application will be available on this website in late February 2019. May - Workplaces submit an Intent to Apply. July - Workplaces submit their Applications. October - Workplaces receive their awards at the ceremony. 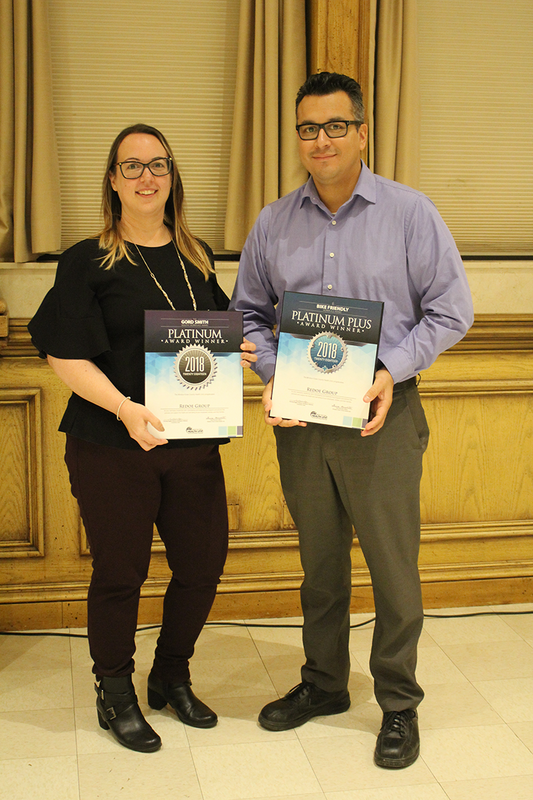 Read stories here about the 2018 Gord Smith Healthy Workplace Award Winners’ hard work and commitment towards enhancing the health of their employees. The Windsor-Essex County Health Unit held an alPHa Challenge event called a Pirate Treasure Hunt. This year, all staff were provided with 30 minutes of paid work time to participate in the Treasure (Scavenger) Hunt, which consisted of different areas around their offices where they participation in physical activity or other healthy lifestyle behaviours. Some of the different points on the Treasure Map were bike racks, and the trail systems around the offices. The Corporation of the Town of Tecumseh (Town) is committed to the health and wellness of its employees. This year, the Town and its Wellness Committee organized an event entitled “Gardening with Casey”. Casey Colthurst, Manager of Parks & Horticulture provided a basic organic gardening course to interested employees, emphasizing that gardening was a great way to get in some exercise and receive the benefits of fresh air and mental health wellness. The employees were informed of the activity through their monthly Wellness Newsletter. The Town displays their commitment to promoting and supporting physical activities for its employees through their newsletters and employee workshops. This year Essex Power held an its first annual Employee and Family Flu Shot Clinic. The clinic was held on site and during working hours to allow for staff participation. The week prior to the clinic, staff were provided with information via emails and posters about flu prevention and the importance the flu shot plays in prevention. Their flu shot clinic was well attended by employees from multiple work locations. The Canadian Mental Health Association, Windsor-Essex County Branch is committed to employee health and wellness. They have a committee of various staff who meet throughout the year to discuss health and wellness, as well as plan wellness activities. These activities and education sessions aim to promote healthy lifestyle choices for all employees and their families. Their wellness program encompasses various benefits available to staff including a Family and Employee Assistance Program, Corporate GoodLife Fitness Membership and Change4Life Portal (for plan members) through GreenShield. They also have a staff lounge with fridges, toaster oven, microwaves and dishwasher. Their staff intranet includes wellness resources on various topics such as sun safety, staying hydrated and self-care tips. Following their Wellness Survey in 2017, they focused on initiatives that staff members had expressed interest in. Some activities included: Noon Hour Yoga Sessions for Staff, Arthritis Information Session, Healthy Eating For Optimal Health, Hypertension Lunch and Learn, Suicide to Hope Training, Ergonomic Chair Replacement Program, Creating a De-Stress Bin and Puzzles, Flu Shot Clinic for Staff, Walking Wednesdays and a Suicide Prevention Walk. Windsor Regional Hospital is dedicated to the welfare of its employees though physical activities and proper nutrition. As a hospital, they believe in “practicing what they preach” and encourage all staff to live the best lives they can. It is for this reason that they committed to having programs and services that support physical activity at work and provide healthy food choices throughout the hospital. The Healthy Lifestyles Program offers comprehensive wellness through physical activity and information to their staff that they can easily translate outside of the workplace and in their homes. During lunch, they offer Yoga for 45 minutes, Pilates and Stretch & Tone for 1 hour. All three programs are very popular at their hospital. Employees have commented that Yoga is helping them balance their work and lifestyle. It has helped them to have their physical and mental balance, which in turn has a direct effect on their work. Redoe Group began their Wellness journey just over 7 years ago and are proud that they have come such a long way. In 2018 they held their 5th Annual Wellness Week which included a yoga demonstrations; nutrition, Lunch N’ Learns on the prevention and warning signs of the most common cancers in men, building resilience and improving your mood; as well as participation contests all week. The grand prize at the end of the week was a Fitbit Versa. They held their 7th Annual Bike to Work Week in July, and participated in the Big Bike Ride for Heart and Stroke in June, with the company matching all donations. They pride themselves on being an organization that is socially responsible. They are committed to the health and wellness of their employees, their families and the community. For the 8th year in a row, Hiram Walker & Sons Limited shut down its offices and operations on June 7th, 2018 to join 18,500 global employees in more than 100 community projects to help achieve the United Nations’ sustainable development goals! This year Hiram Walker & Sons Limited partnered with Swim, Drink, Fish and the University of Windsor to conduct water testing on the Detroit River. They also gave back to our city by improving a space where the neighborhood could come together. This year they returned to Ford City to build upon the impactful work from the prior year by cleaning and painting fences in alleyways, restoring flower beds and roadside planter boxes, restoring resident garden beds, and building the community garden irrigation system. This initiative was a success not only for the community, but also for their passionate employees who are proud to dedicate their time and support this local initiative. BANA has been committed to enhancing workplace wellness and has recently updated it's policy manual to ensure these wellness endeavors are a priority. With a small staff of only 9, BANA realizes the importance of physical activity, as well as self-care and mental health, and thus has introduced walking breaks to allow staff to take time away from their desks each day. These walking breaks are 20 minutes and can be taken at any time during the day when it does not conflict with scheduling. Walking meetings are also encouraged, when appropriate. This is a year round opportunity for staff to take some time outdoors, to step away from the office, clear their minds and get physically active so they can return feeling refreshed and productive. The BANA staff participated in a survey where they unanimously agreed that these walking breaks have enhanced their productivity and workplace wellness. 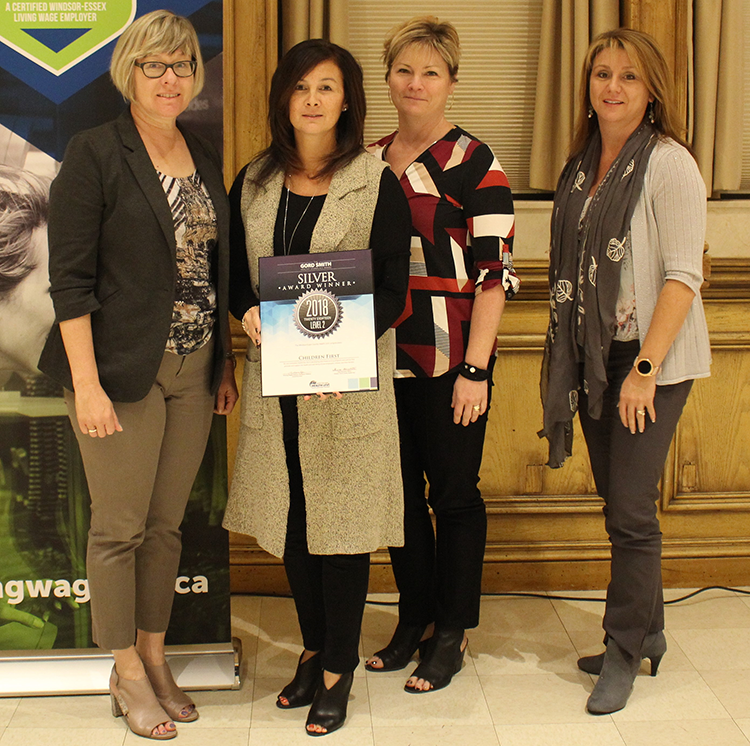 The Corporation of the Municipality of Leamington is committed to promoting a healthy workplace environment for employees. In 2018, they concentrated on Prevention and Awareness with a focus on Healthy Eating, Physical Activity and Health and Safety. Highlights of their initiatives included their annual Active Week which now includes a Wellness Fair, cooking classes and BBQs, as well as a growing health and safety program. They also had many other fun events such as a nature walk, a pickleball tournament and a relaxing colouring session. They encouraged staff to walk/bike to work during Active Week and all of their departments received fruits and vegetable from nearby farms. 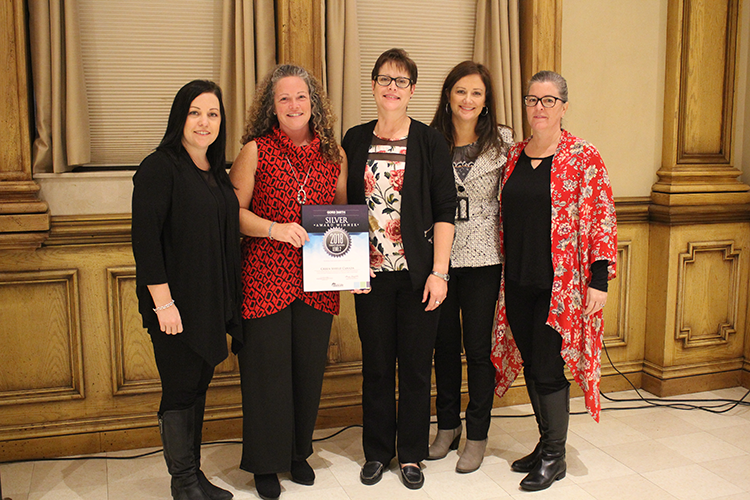 This year the Corporation of the City of Windsor Wellness Program successfully executed their Workplace 2018 Wellness Plan. They joined in on the National Campaign of Mental Health week, and extended the campaign for the entire month of May to have a Mental Health Month. They offer a number of workshops and presentations to allow staff to learn, talk, reflect and engage with others on several issues relating to mental health. Some examples of topics covered included: when grief comes to work, the power of social media, how employees' can support their kids mental health and understanding the management of sport related concussions just to name a few. Additionally, employees were encouraged to come to Charles Clark Square and participate in a 1 km walk or roll along the riverfront to celebrate a Downtown Core Partnership Wellness Event! 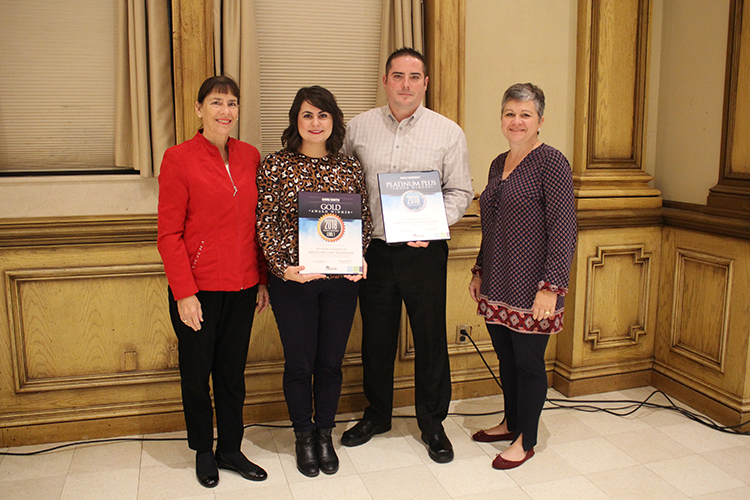 The City of Windsor and the University of Windsor took a stand for Mental Health in support of the CMHA Sole Focus Project and National Mental Health Week. CenterLine (Windsor) Limited is proud to promote and encourage a healthy and active lifestyle. Their Wellness Committee organized several activities and challenges this year that were subsidized by CenterLine. They are currently in the final stages of expanding a walking path that will connect their newest facility to their existing ones. This 1.5 km long path offers a safe and dedicated space to engage in physical activity during breaks, lunches and is a means of travel between facilities. They are proud to be a company that offers such a wide range of activities, challenges and resources to employees and their families and they look forward to providing additional opportunities throughout the years to come. Bonduelle Tecumseh hosted a Health Challenge contest from Jan 21st to Feb 24th, 2018. Participants kept a weekly log for five weeks documenting their food/drink intake, exercise, and sleep information. The idea behind the challenge was for participants to be more mindful of their health and wellness so they can identify areas for improvement. Participants had a chance to win weekly prizes if they submitted their logs on time. All logs submitted were entered into a draw for a final $100 gift card grand prize. 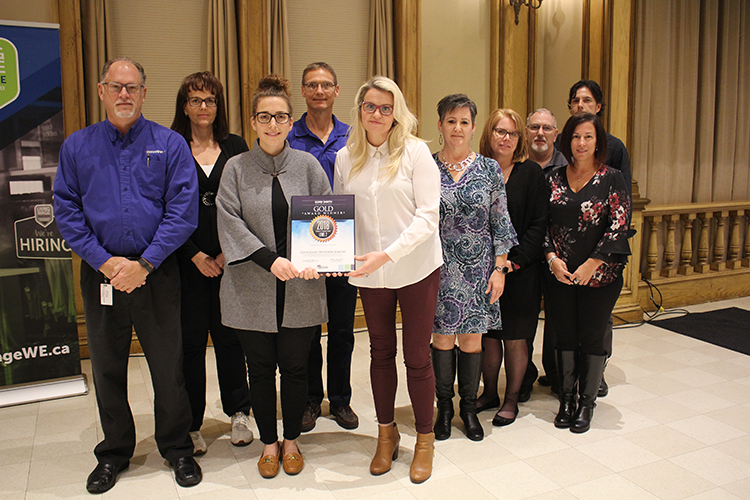 The Town of Amherstburg focused on mental health and emotional wellness as part of their corporate wellness program. They raised awareness by offering mental health webinars through their employee assistance program provider, Morneau Shepell. Webinar topics included Mental Health in the Workplace and Coping & Resilience in the Workplace. In September, they held a Sleep Tight Challenge where employees were challenged to get 7 – 9 hours of sleep each night during the challenge. Employees documented their sleep on a scorecard and points were awarded for achieving recommended levels. Employees then earned ballots depending on their overall point level and a raffle was held for a one hour massage gift certificate. Employees were also provided with a Sleep Guide with information. Their management group was certified in Mental Health First Aid through training provided by the Mental Health Commission of Canada. Managers received training on how to provide support and guidance to employees, how to comfortably have conversations about mental health issues and how to best offer support. 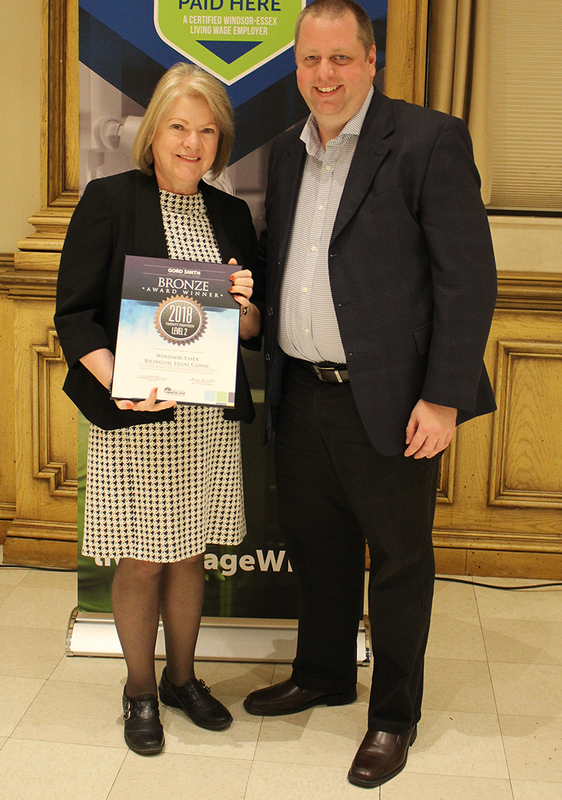 St. Clair College has taken many steps over the last several years to become a healthy workplace. Their Wellness Committee is well supported by their Senior Operating Group who realizes that the successful operation of their business is reliant upon its employees. The importance of employee health has now become a corporate value. Working together, a supportive environment has been created to assist their employees to strive towards better health, both mentally and physically. This the transformation of many of their workers has contributed to an overall positive work environment, which further affects their community at large. They would like to thank the many community partners who have contributed to their wellness initiatives and have been always ready to share their expertise. identified that that there was an increase in reported needle stick injuries at Hotel Dieu Grace Healthcare. With a goal to eliminate all needle stick injuries at Hotel Dieu Grace Healthcare, a Sharps Program was implemented. This program included the creation of an annual inventory list, which identified what types of Safety Engineered Needles were being used in each department, implemented an annual audit and finally hands-on return demonstration training for all clinical employees. As a result of this annual Sharps Program, their needle stick injuries have steadily declined each year. In fact, as of the time of this submission, we have had zero (0) needle stick injuries for 2018. Greenshield Canada started 2018 off with a little Mindfulness. Their Mindfulness program is available to all staff on their Change4Life portal and supports their overall focus on health and well-being via their My Health Advantage Program. The Program guides participants through the techniques and concepts behind mindfulness. Employees are encouraged to complete a series of six sessions at their own pace, with each session combining audio and video components, as well as onscreen education materials and a workbook. Incentives to win a $100 Visa gift card and mindfulness journals helped kick off the program and entice employees to complete a session of the program. During their Mental Health Week, staff received a handy guide to keep Mental Health resources in one place. These were delivered with a “brainy” magnet to hang on their fridge. Their Leadership team received an educational presentation on them how they can be advocates for Health Management by supporting employees with the resources available to them through Green Shield Canada benefits, Bounce Back, Change4Life, Big White Wall and Mourneau Shepell. Children First had a workplace mental health campaign during Mental Health Week, May 7 through 11, 2018. During the Week, the agency promoted a mental health awareness/anti stigma campaign including the following activities. They posted awareness messages and mental health resources on their Wellness bulletin board. They sent e-mails to all staff to promote planned activities and provide resources on mental health in the workplace. The agency also provided a small budget for snacks and raffle prizes for the last event in the week. 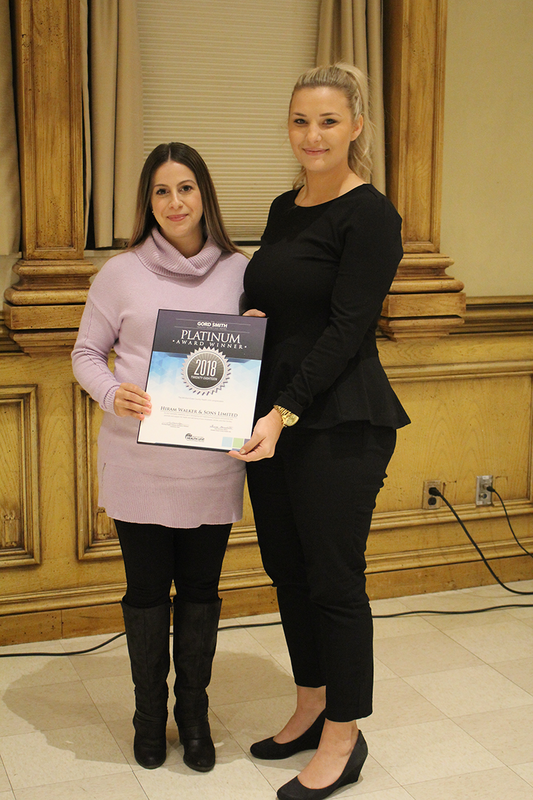 Windsor-Essex Bilingual Legal Clinic held an Activity Challenge to increase the physical activity during the workday. In their post challenge survey, 88% of staff participants indicated that they plan to continue their healthy physical activities. The Sexual Assault Crisis Centre had a Walking Challenge to encourage staff to take regular breaks to get outside the office and walk around their local residential neighborhood. They posted sign-up sheets in their lunchroom with weekly draws and a final grand prize draw to help encourage participation. All of their employees participated in the challenge. Yoga in the workplace has become a topic that JC Fresh Farms feels extremely passionate about. It started as something that was an absurd idea, to pay our employees for yoga sessions during work hours. The nature of their industry is extremely fast paced and time sensitive, so it didn't seem practical. The one class they started two years ago, has turned into an ongoing element in their workplace. Employees are now asking when the next session is. In the midst of their peak seasons, they have managed to find time to schedule yoga sessions in for the employees. Not only has it given employees helpful tips and tools to help with strenuous labor, but it helps with the stress of the job. They have been very fortunate to have employees who support their beliefs in wellness and see the positivity it brings into the workplace. Financial Fitness participated in Langlois Community Hub Walking and Activity Challenge. They arranged for a Personal Trainer and Certified Wellness Coach to hold several 15-20 minute active training sessions onsite at their office building. He led staff in active stretching exercises that could be completed at their workstation throughout the workday. Staff had an opportunity to build skills by practicing the activities that they continue to use since the event. Family Services Windsor-Essex held a Walking & Activity Challenge, as part of the Langlois Community Hub, for 4 weeks in May 2018 to kick off the spring. The goal was to increase the physical activity level of their staff during the workday. They encouraged people to go for a walk, as well as to schedule regular times to get up, walk around, stretch, deskercise, etc. throughout the workday. They sent emails to all staff inviting them to participate and to complete pre and post event surveys. In the post event survey, 80% of office Hub staff participants indicated that this activity influenced them to make positive lifestyle choices. 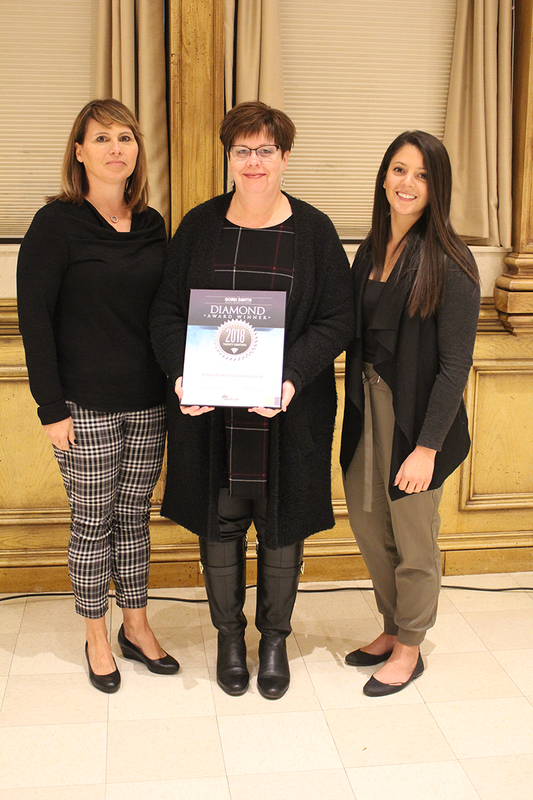 The Town of Lakeshore is committed and accountable for providing a safe and healthy work environment for its staff through a proactive occupational health and safety program. One way the Town fulfilled this commitment was by purchasing large 64-ounce insulated water containers for their outside workers. This helps to ensure that they always have an adequate supply of water during the day to proactively prevent any heat related disorders while working outside during the hot summer month. It also reduces their environmental footprint by decreasing the amount of unnecessary plastic water bottles that may otherwise have been used. Their Supervisors and Managers regularly communicate with Human Resources to monitor the weather alerts and ensure staff are given longer or more frequent breaks during high heat and high humidex days. The Owners and Senior Management of Empire Communications are vitally interested in the enrichment, health and wellness of its workers. They encourage employees to take charge of their physical and mental health, while ensuring Management takes a holistic approach to worker health that includes workplace safety, a supportive environment and employee empowerment. One of the ways they promote workplace wellness is by offering healthy snacks as an employee perk. They find that they all benefit from increased motivation and productivity and greater teamwork and camaraderie -- snack time draws people away from their desks to a communal area to chat and encourages healthy habits at the same time. 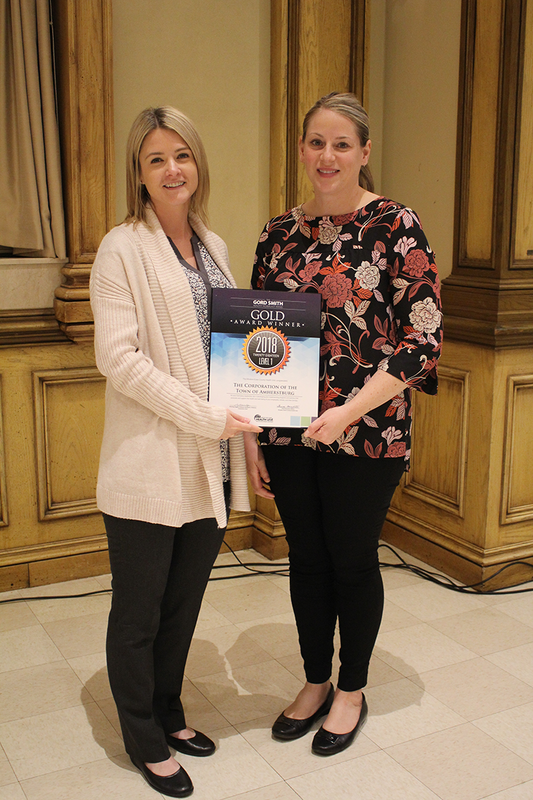 In November 2016, Assisted Living Southwestern Ontario implemented an Employee Wellness Committee to improve the overall well-being of employees. Since that time, they have made incremental changes with a specific focus on nutrition. Meals prepared on-site through their Job Skills Training Program are available for employees to purchase for a nominal fee. The menu was revamped and included fresh greens and vegetables that are seasonably grown on site. In some instances, leftover produce is available for staff to bring home. They replaced chocolate bars and processed snacks for purchase with healthier options: freshly made banana bread that is portion controlled and a fresh fruit bowl. Their newly adopted Healthy Meetings criteria is used not only for meetings but also at social events including BBQ’s, parties and more. Their agency wide Canada Day BBQ this year included salads, quinoa and fruit as opposed to chips and fried snacks. 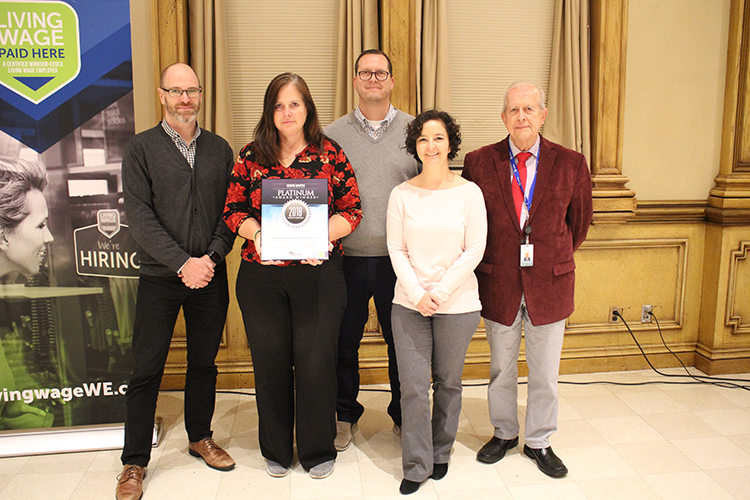 Read stories here about the 2018 Gord Smith Bike Friendly Workplace Winners’ commitment to promote employee well-being through active transportation. The Windsor-Essex County Health Unit held one-hour lunchtime workshops at each of their three offices called Cycling for Health & Well-Being. 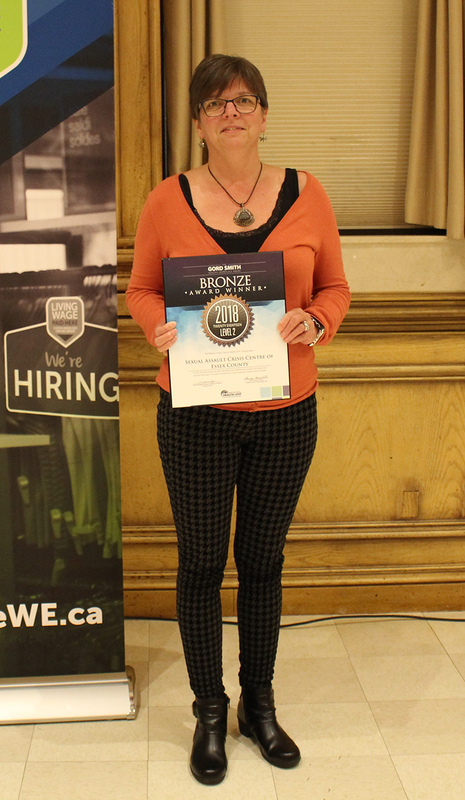 The workshops aimed to advance the WECHU’s bike friendly workplace culture while also providing awareness raising, education, and skill-building activities for staff. Each session promoted bicycling as a safe and health promoting activity for staff and their families. The Corporation of the Town of Tecumseh continues to promote its Bike Friendly Workplace Policy by circulating information to employees on the benefits of biking to work, providing bike safety information and by encouraging employees to take advantage of its bike friendly facilities and incentives, which include change rooms, showers, bike racks and company vehicles for work related business. In 2017/18, the Town of Tecumseh continued to incorporate biking to work into its Fitness Fridays’ Activities. During Fitness Month (June) employees were once again challenged to bike to work. In order to increase participation among those employees who live farther away, a common meeting area at a nearby park was organized and an experienced cyclist mapped out a safe route and led the way to Town Hall. Redoe Group is proud to be a Bike Friendly workplace. Over the last 7+ years they have purchased a bike rack and promoted riding your bike to work. They annually take part in the Big Bike Ride for Heart & Stroke, and hold their own annual Bike to Work Week. During Bike to Work Week, they have contests and information about taking care of your bike and bicycle safety for their employees. They look forward to continuing to promote bike friendliness to their employees, their families and the community. 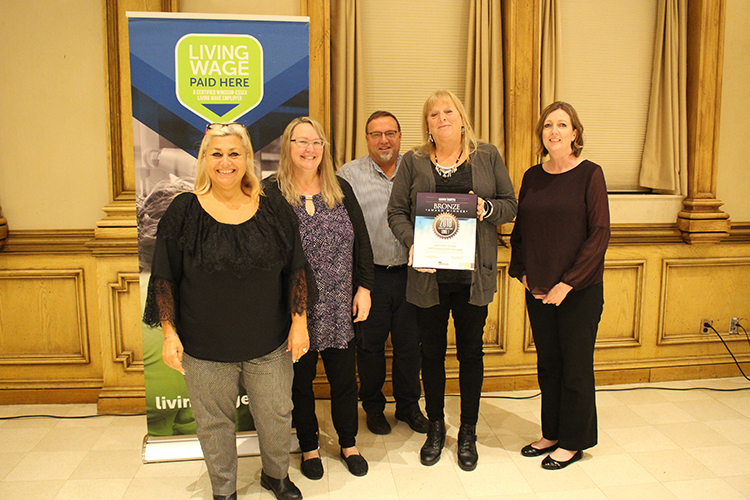 The Corporation of the Municipality of Leamington is committed to the health and well-being of their employees and their families. By being a bike friendly workplace, they encourage their employees to use active transportation to commute to work and to choose cycling as a way to be active with friends and family. Since 2011, Leamington has been on a roll promoting cycling through our Bike Friendly Workplace Policy, incentives and facilities. Three large bike racks were added to their uptown core area for staff and residents. With yearly additions to their municipal trails, employees and residents can easily commute around the town and to work. The Corporation provides prizes for staff who ride their bikes to work during Active Week. They offer amenities such as change rooms and showers for staff so that physical activities and biking to work are encouraged. St. Clair College values a safe, healthy and appealing work environment. As an educational institution, the college wishes to promote a healthy lifestyle and is committed to establishing a supportive environment to lead the way towards workplace wellness. What better way than to promote biking to work as a healthy lifestyle alternative. Their Senior Operating Group in collaboration with their Wellness Committee realizes the importance and benefits of workplace wellness and its impact upon the success of their organization and community. 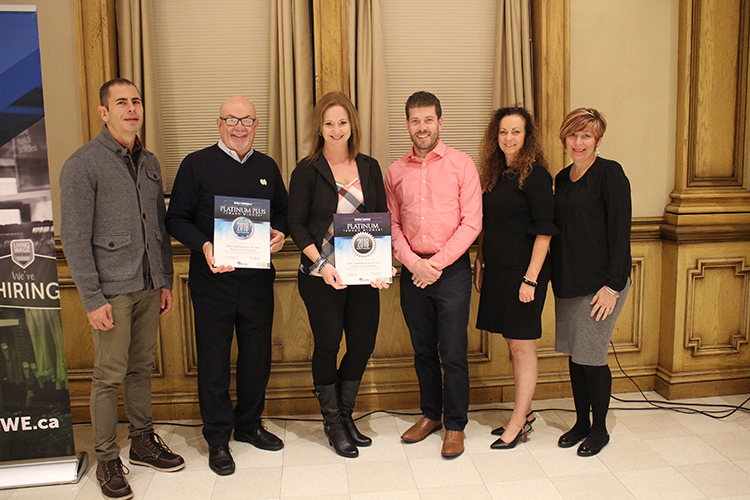 The City of Windsor’s Workplace Wellness Program encouraged staff to support Bike Month in June 2018. Staff were informed about various cycling opportunities available in the city during the month of June. Employees were encouraged to bike as a means of transportation and recreation and to get active. 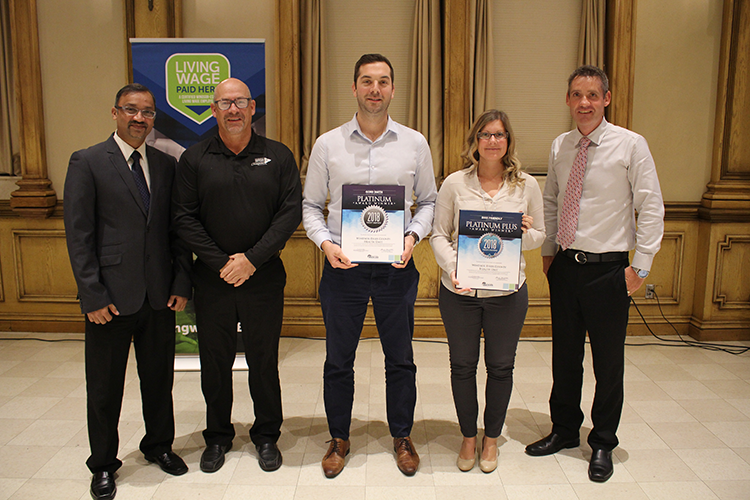 This year, the Wellness Committee and the City of Windsor’s Environmental, Sustainability and Climate Change Office teamed up to encourage City of Windsor employees to participate in the National Commuter Challenge and leave their cars at home. Employees who chose to walk, cycle, carpool/ride-share or take public transit to work between June 3rd to 9th could register for their chance to win a gift card! As part of the promotional campaign for the National Commuter Challenge, booths were set-up at a number of City of Windsor facilities to engage employees in conversation with an Environmental/Wellness Champion to learn more about the National Commuter Challenge, different initiatives currently going on within those areas, and why the celebration of active and sustainable transportation is so important. As part of their wellness program, Bonduelle Tecumseh actively promotes the benefits of safe cycling and encourages their employees to ride to work. 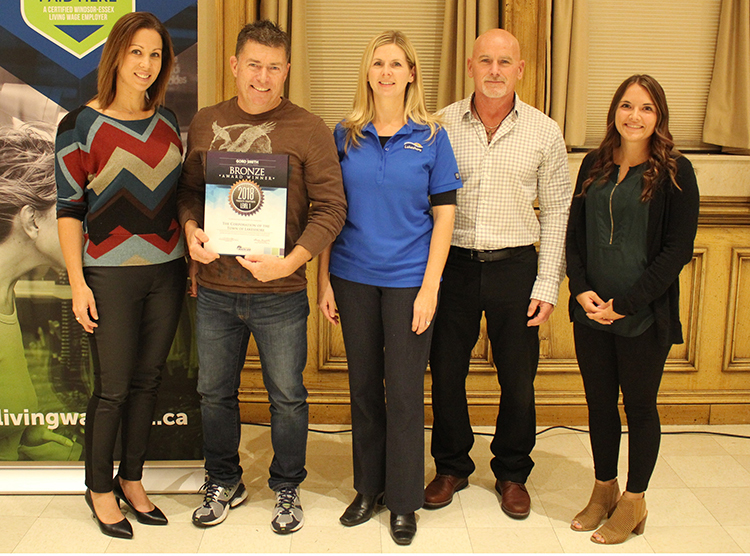 Bonduelle Tecumseh supports cycling to work as it promotes employee fitness, stress management, and their commitment to a sustainable environment. To meet their goal of being a Bike Friendly Workplace, they maintain bike facilities; provide biking incentives and education through newsletters, posters, and contests. They also have a Guaranteed Ride Home Program to support their employees who bike to work. This program ensures in the event of bad weather, a flat tire, or an emergency at home, cyclists can always get a ride home. 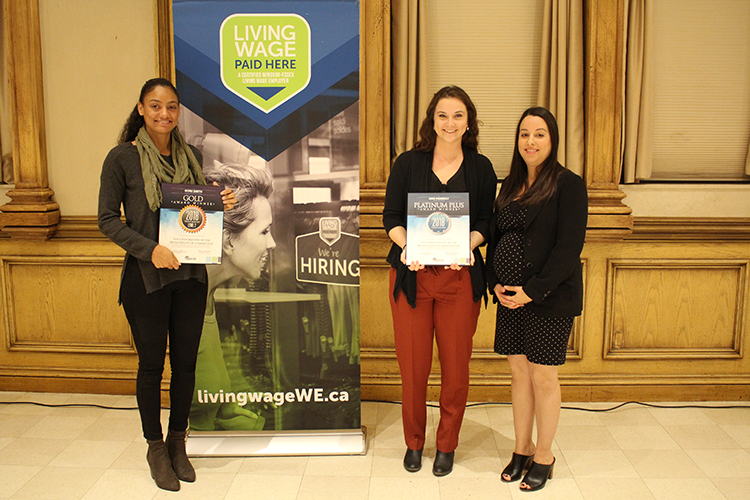 How can employers show their commitment to providing a living wage for their employees? 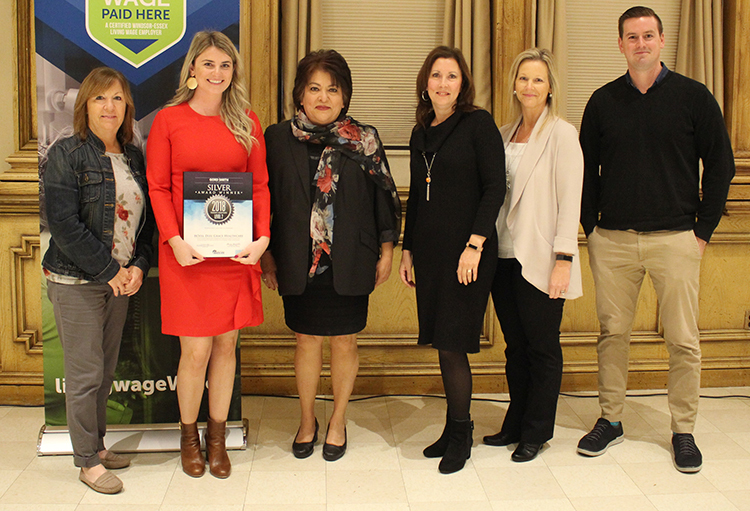 The Windsor-Essex County Health Unit’s Certified Living Wage Program aims to raise awareness about the true cost of living in Windsor and Essex County. 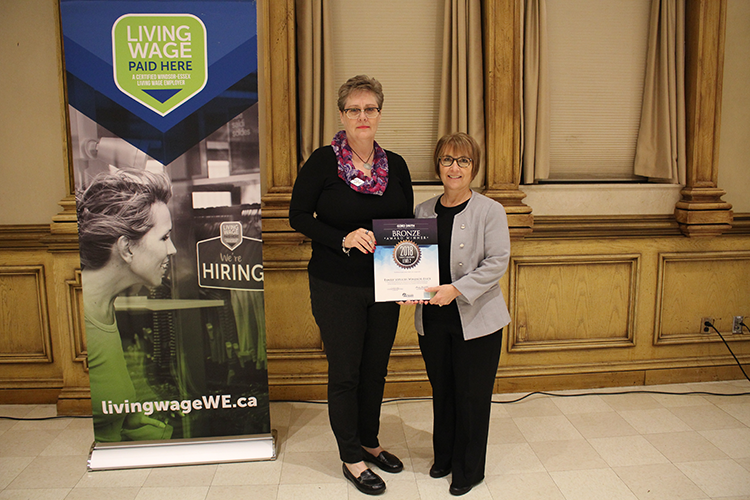 The 2019 living wage rate in Windsor and Essex County is $15.15. 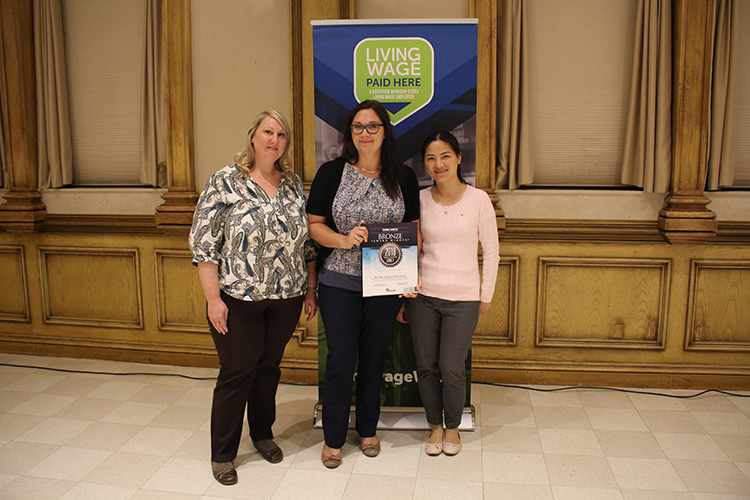 Workplaces in Windsor and Essex County are encouraged to become Certified Living Wage Employers. 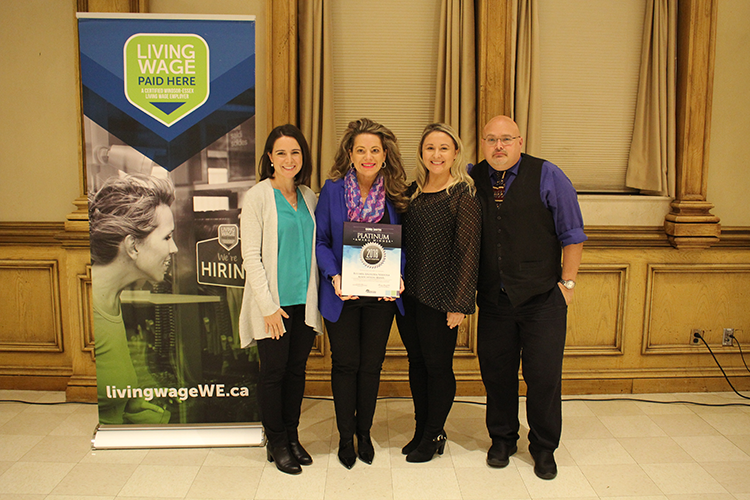 To be eligible for the Gord Smith Healthy Workplace Award Platinum and Diamond levels, workplaces must be a Certified Living Wage Employer.